Women can propel India towards second green revolution provided they get opportunities and adequate facilities, Agriculture Minister Radha Mohan Singh said. He said that the government through its various policies is providing opportunities to women such as organic farming, self-employment scheme and Pradhan Mantri Kaushal Vikas Yojana. Women play an important role in the agri sector through labour supervision and participation in post-harvest operations, Singh said at the Rashtriya Mahila Kisan Diwas celebrations here. 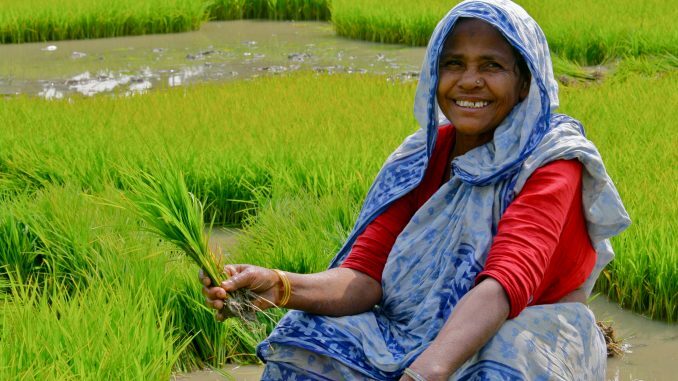 As per the the Food and Agriculture Organisation, women’s contribution to Indian agriculture stands at about 32 per cent. Women are involved in 48 per cent agriculture-related employment whereas 7.5 crore women are playing a significant role in milk production and livestock management. “To strengthen women’s participation in agriculture and allied activities and to improve their access to land, loans and other facilities, the ministry has policy provisions like joint leasing for both domestic and agricultural land under National Policy for Farmers,” he added. Singh added that the aim is to ensure that women contribute effectively to agricultural production. “Therefore, proper structural, functional and institutional measures are being promoted to empower women, to build their abilities and to increase their access to input technology and other agricultural resources and various initiatives have been taken in this regard,” he added. He also informed that in 2016-17, 21 techniques related to women were evaluated and 2.56 lakh women were trained in agriculture-related fields like animal husbandry and poultry. He added that to ensure various beneficiary-oriented programmes reach them, the emphasis is on the formation of women self-help groups to connect them with micro-credit through activities like capacity building.